"The Organization for Economic Cooperation and Development released its report on broadband usage and penetration with some interesting findings and observations." " The number of broadband subscriber in the OECD reached 235 million by December 2007, an increase of 18% from 200 million subscribers in December 2006. . This growth increased broadband penetration rates to 20.0 subscriptions per 100 inhabitants up from 16.9 in December 2006. * Denmark, the Netherlands, Iceland, Norway, Switzerland, Finland, Korea and Sweden lead the OECD with broadband penetration well above the OECD average, each surpassing the 30 subscribers per 100 inhabitants threshold." You can all stats in Excel files on the OECD site. 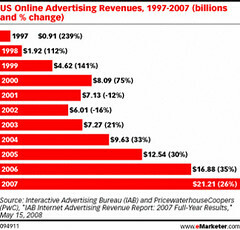 extremely interesting and disparate numbers just published by eMarketer ! "Internet users in the US watched 11.5 billion online videos in March 2008 , up 13% over February 2008 and 64% over March 2007, according to comScore Video Metrix. That is an average of 83 videos watched per viewer during March." "Nearly 139 million U.S. Internet users watched an average of 83 videos per viewer in March"
73.7 percent of the total U.S. Internet audience viewed online video. 84.8 million viewers watched 4.3 billion videos on YouTube.com (50.4 videos per viewer). 47.7 million viewers watched 400 million videos on MySpace.com (8.4 videos per viewer). The average online video viewer watched 235 minutes of video." "Nielsen Online also measured online video viewing in March 2008, with different results. Nielsen, which only measured streams, reported an average of 137.3 minutes of online video viewed for the month—nearly 100 minutes less than the comScore study." "One explanation for the difference between the comScore and Nielsen data is that Nielsen did not include universities, which are home to some of the most active online video viewers. Another possibility is that downloaded videos could include more full-length movies, which are longer than most videos, and would therefore increase the average amount of time spent watching online video in contrast to a streaming-only sample. David Hallerman, senior analyst at eMarketer, said that online video viewing data indicated possibilities about ad-supported online video sites—but only possibilities. He noted that just because people were watching video online did not guarantee that advertising dollars would follow. "In fact, even if downloaded longer-length videos such as movies were the missing element between comScore and Nielsen data, that video content would still be difficult to monetize through advertising," Mr. Hallerman said"
Since I've moved to twitter for my main way of communicating online, the traffic on my blog had decreased quite significantly. In particular I hardly ever get a comment anymore. 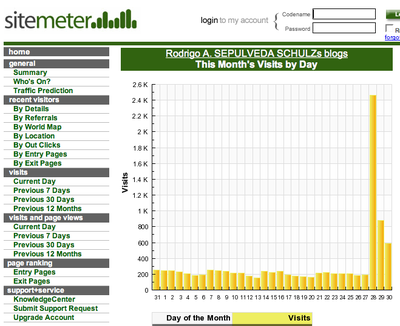 So when I started getting 10 comments in a hour a few days ago, I knew something was wrong : Digg ? Slashdot ? engadget ? Techmeme ? As a mater of fact, Robert Scoble wrote about my problems with Facebook, and that drained a LOT of traffic to the site. 1) this document only applies to the web, and does not take into account the emergence of convergent devices (IPTV, mobile, podcasts) in addition to the Web. In particular we should probably treat linear and non-linear video ads in the same way on those devices. This document lacks a proper approach to other devices.
. 2 Mbps bitrate is way too much with current videos. Try 400Kbps for video and 96 Kbps for audio for example as a minimum. We need to keep in mind the download link.
. A key frame every second is not a proper way of doing this. Some content require a lot of keyframes, some other do not (newscast with a speaker for example). I would rephrase to be a recommendation only.
. MPEG2 is a lousy codec that takes too much space for the Internet. It should be removed from the list. WMV, H.264 are great. What about divx or xvid ;) ?
. ratio : 4:3 and 16:9 then totally ignore that some mobile phones, used in UGC to dot respect this ratio. playing a video + ad will then require to have a video play in 4:3 or 16:9 ratio ?
. no maximum file size for the ad ?
. no recommendation on how often a non)linear ad should be displayed within a video file or a playlist ?
. this recommendation only takes into account banner overlays. what about LOGOS, Picture-in-Picture, rolling text ?
. an overlay + post roll or ending bumper ? Version 2 of this documents is definitively in beta phase still.